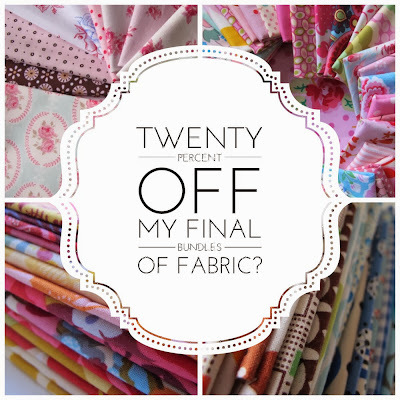 Would you like to know what fabric I actually have left after my huge clear-out last week? Well, I still have plenty of dressmaking fabrics, Liberty lawn and some Oakshotts, but as far as quilting fabrics go, the scraps above are all that I held back. They add up to less than a yard in total. I think that qualifies as my biggest ever seasonally-inappropriate Spring cleaning exercise. It was an odd experience packaging up the entirety of my quilting fabric stash, but ultimately liberating. It felt like I had fabric stashed away all over the place that had been bought at a time when I had my little shop or very young children to make things for and, no longer having either of those things, the inspiration for using the fabrics seemed to have passed. The awfulness of seeing so much much-loved fabric gathering dust made me feel pained each time I caught sight of it. So despite some of the fabrics being ones I could still have happily sewn with for myself or my children, I had an overwhelming desire to start afresh, so I'm incredibly grateful to all those of you who took away the entire contents of a life's fabric stash in just a few days. It's so lovely knowing that they may now be sewn into lovely things and properly enjoyed. 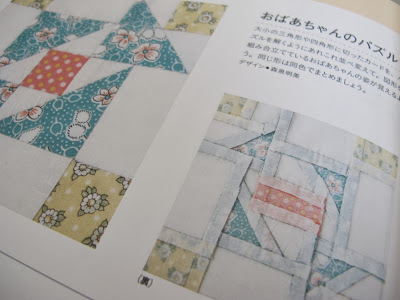 The last time that I destashed some fabric, a few months later, Mary (who sometimes comments on here as 'Homebird'), wrote and sent a photo of the English paper pieced quilt that she'd made using the bundle of duck egg blue fabrics that she'd bought from me. 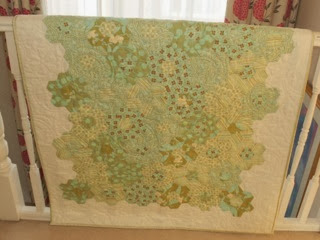 I hope that Mary won't mind me sharing the photo of her quilt with you here, but it's stayed with me as I felt so delighted that she'd had inspiration where I hadn't seen any and created something beautiful where I hadn't managed to do so. 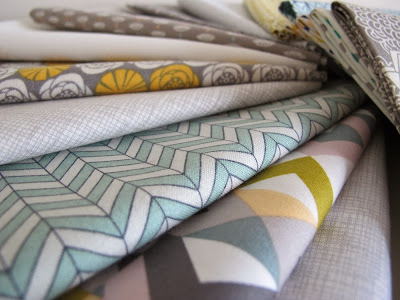 I'm really hoping to catch sight of some more of the lovely fabrics that I've said goodbye to over the coming months. Not too long into my destashing exercise, when I only had a very little amount of fabric left in my Etsy shop, I started to feel a bit odd as I suddenly had new ideas for things that I wanted to sew, but a lot of empty fabric drawers. I'd originally thought that I wouldn't wish to re-accumulate fabric, like a squirrel with over-stuffed cheek pouches, ever again. 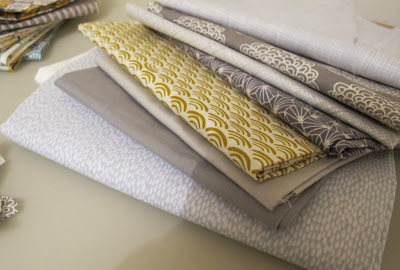 I actually wondered whether I would buy ANY fabric ever again when I was listing them on Etsy. However, while I'd like to attempt to gather my fabric in a more dignified, less squirrelly, way in future, I realised that I really did still want some quilting fabrics in my life, just new ones and far less of them. 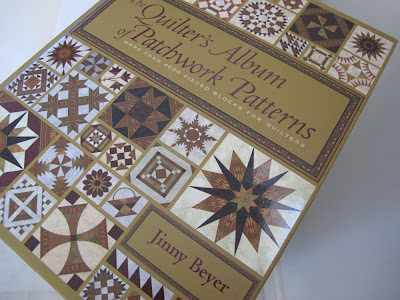 It's actually a long time since I've bought any quilting fabrics - I think possibly eighteen months ago, when I bought the fabrics for my Rouenneries quilt - so it was a mystery to me exactly what fabrics I really wanted when I was buying entirely for myself and selecting fabrics from scratch. After a big think and some 'do I even know my own name without all my fabrics around me' thoughts, I started pinning fabrics from all my favourite fabric shops onto a private board on Pinterest (private, because I didn't want to bombard my followers Pinterest feeds with random fabric photos over the course of three hours one evening!). It was such a refreshing thing to do. What emerged was the I was drawn to soft greys, olivey greens, turquoises and mustards, although not necessarily with it in mind to be used all at once. Th prints are also far more geometric and modern than anything I've bought before. 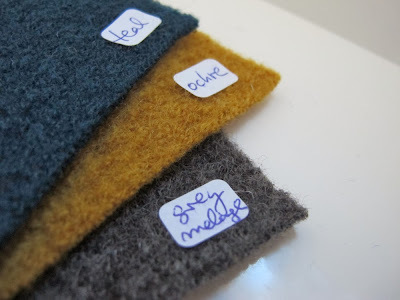 I've loved these colours for years, so I'm not sure why I didn't own more of them, as certainly the mustards and greys are shades that feature heavily in my wardrobe. I finally narrowed my selection of fabrics down to fifteen fat quarters, editing my selection to try and make it so that I could find them all in one place to save on postage costs. It seems that M is for Make has a strong geometric, grey, mustard and turquoise bias! 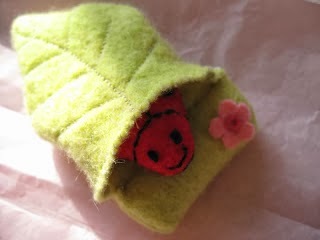 They arrived at the end of last week and sewing has already commenced - I'll show you what I've been up to soon. Changing everything all at once like this always reminds me of the lines to a Bruce Springsteen song that I spent a lot of time dancing enthusiastically around the living room to with my father as a very small girl. While Bruce shimmies around the stage looking adorable (and like he really should stay in possession of both his hair and face), he sings dramatically, 'I check my look in the mirror. Want to change my hair, my clothes, my face'. It's like that, but with fabrics. Do you remember that video? I've just re-watched it - it's the one where Bruce Springsteen invites a previously unknown Courtney Cox onto stage to dance with him. If you're not familiar with this song or even the curious fashions in the video, don't judge me, it was 1984 and I was 6 (although maybe you will anyway, as I distinctly remember my older sister even then being too cool to join us in Bruce mania and requesting instead to be taken to see Boy George when he came to play in Melbourne where we lived at the time). 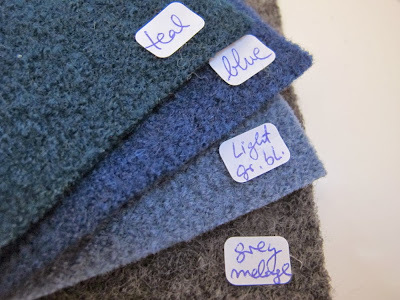 You may remember that I've written about Dragonfly Fabrics' boiled wools before when I made a jacket from the beautiful navy wool they sent to me. 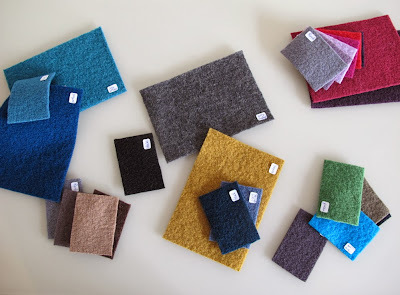 However, Dorte recently sent out a newsletter letting their customers know that they now stocked many more colours...and suddenly, when I saw the swatches grouped so perfectly together in tempting colour groups, for the first time I noticed that they'd also be amazing for making cushion covers, iPad holders and other homewares with. I could barely get these greys and mustard out of my head after I'd seen them. Dorte is making these available as small and large sample packs so that you can see the colours and quality for yourself, as well as 'craft packs' containing larger cuts of 30cm x 30cm, and finally, also by the metre, allowing you to choose any measurement above 30cm if you're working on a bigger project or some dressmaking. I've so enjoyed playing around with the colours from my sample packs. It's difficult to decide on my favourite combination, as the muted colours all go so well together. A nice quality wool felt (normally a 30% wool, 70% synthetic mix or even 100% wool in some cases) is a material where the fibres have been compressed with heat and water to give a flat, smooth finish. Wool felt is the prettier sister of 100% synthetic felt (the type of felt you can buy in Hobbycraft) and is suitable for general crafts, comes in a range of fantastic colours and is wonderful for children to work with as it doesn't need hemming. In fact, my parents have just bought a rainbow stack of this to give to my daughter for Christmas along with some lovely inspiration books. 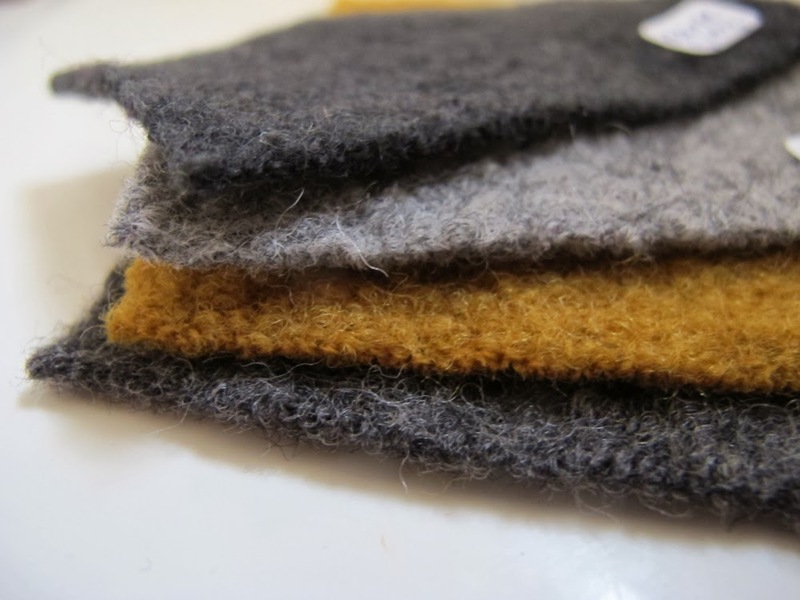 Boiled wool is a wool fabric that has been washed and dried at high temperatures to bring about shrinkage. 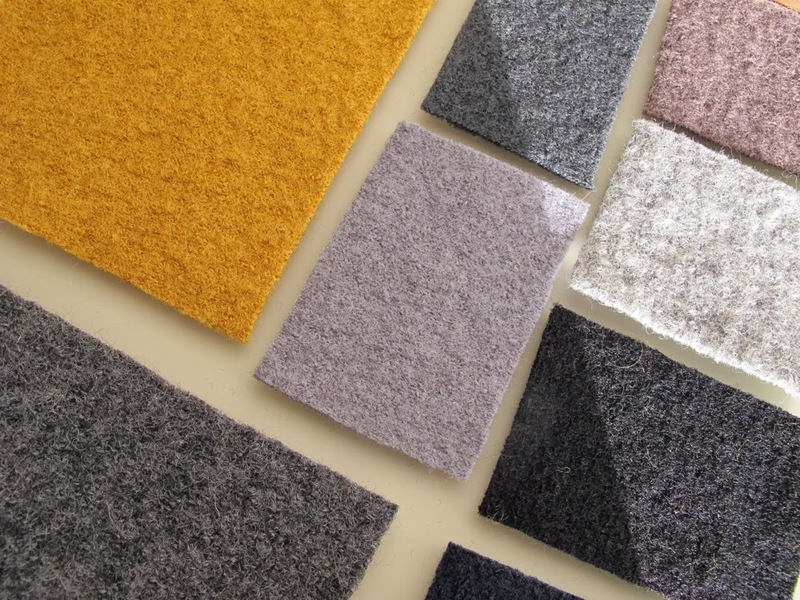 As the fibres contract, a fabric is created that won't fray and that is thick and soft. 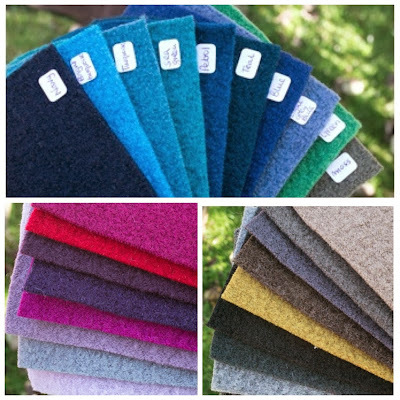 It has a springy, fluffiness to it, quite unlike the smoothness of wool felt. 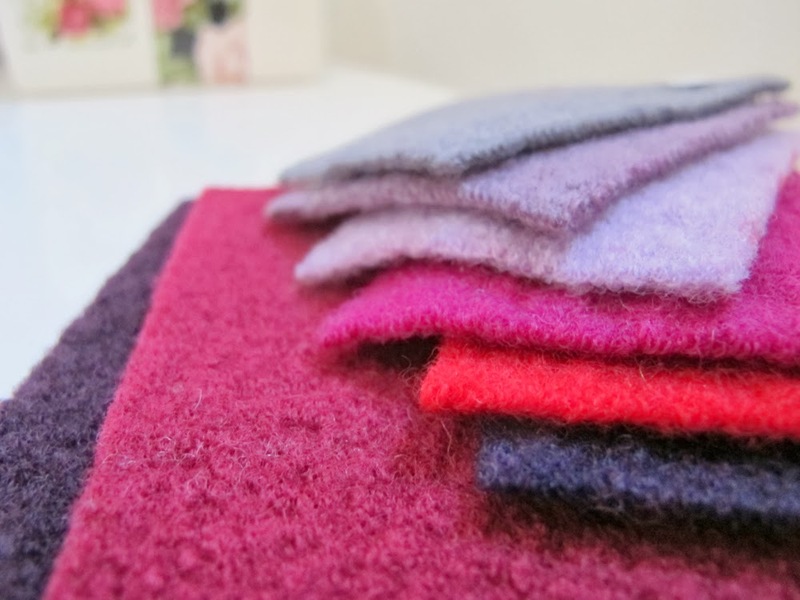 Boiled wool is suitable for clothing and will also naturally repel water in the same way that a winter woollen coat does, making it perfect for jackets and coats, as well as skirts and dresses. The quality of this fabric means that it's also suitable for cushions and other homeware accessories. 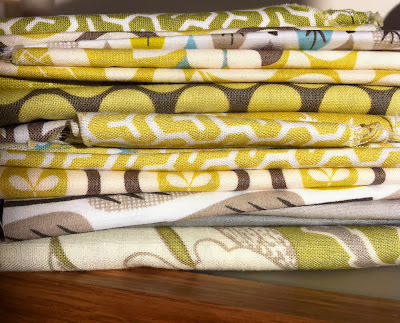 You can find it at Dragonfly Fabrics here. Finally, a word of advice if you haven't sewn with boiled wool before. It's easy to sew with, doesn't wriggle around when you cut it and will never fray. 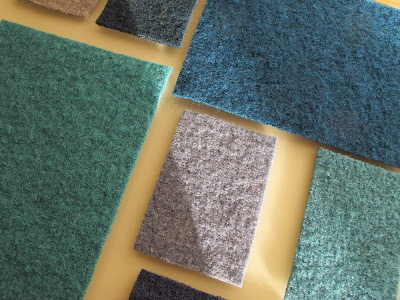 The one area of construction that requires care is if you decide to turn on your iron as boiled wool can stretch and pull out of shape a little if you wield an iron in its direction, additionally, over-pressing can make the fibres look a little bit tired. So if you must press (and I must always press. I'm simply incapable of sewing anything without bringing my iron into, even English paper piecing) keep the heat low and press sparingly. 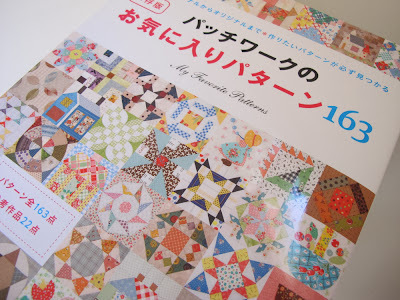 I've been meaning to tell you about my favourite patchwork block books for a while and now that I have a new book to add to my collection, it's prompted me into action. 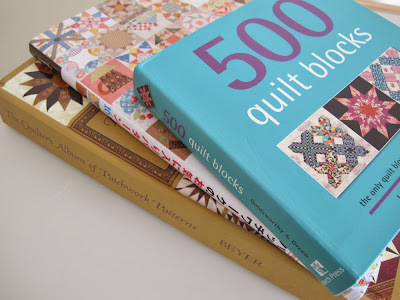 I love studying block books - they act as a springboard for all kinds of things, or you can pick one out and make a whole quilt from that block (not actually my favourite way of doing things - I nearly expired through boredom making my snowball quilt) or create a sampler quilt including all your favourite blocks. I noticed recently on Instagram some quilters hash-tagging #tula100 and when I clicked on the hashtag I saw the most amazing collection of blocks being sewn up. They are incredibly modern, full of clean lines and clever pictorial fabric placements - they're all based on the patterns from Tula Pink's City Sampler Quilts: 100 Modern Quilt Blocks . If you're on Instagram do go and have a look...and if you have the book, please tell me about it! It looked as though you make the blocks up at the actual size of the photograph on each page? 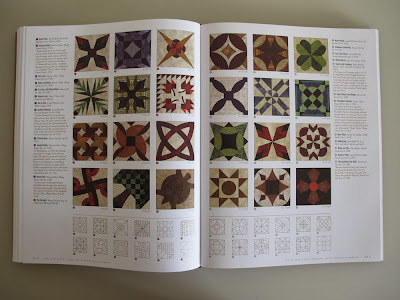 I love the idea of keeping these finished blocks stored between the pages, like an unfinished dictionary of work. Anyway, let's move on to the books that I do own. First 163 My Favorite Patterns. This is a Japanese pattern book, so naturally, it's written entirely in Japanese. However, the diagrams are so explicit that words don't feel entirely necessary. For each block '163 My Favorite Patterns' gives you: a photo of the finished block; an outline of the block which you can create your pattern pieces from, by enlarging it on a copy machine and then adding seam allowances; a numbered diagram of how the pieces go together and what order they should be sewn in; and finally, the absolute best bit, a photo of the back of the finished block, showing how all the seams have been pressed. 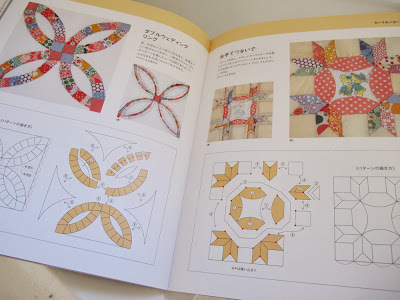 For a geek, this bit is completely fascinating bedtime reading - I love studying their tiny, perfect stitches, it's also fantastic as a practical aid once you're actually making the blocks. I've never been able to gather what percentage the author has intended you to increase the block diagram by, so I guess it's really down to personal preference whether you choose to make tiny or large blocks. This iconic book isn't particularly easy to track down and when you do it's likely to be expensive. However, it's one of those books that I take off the shelf regularly to look at, so to me it feels entirely worth the exorbitant price. The Workroom sometimes has copies in, or you could try Etsy. It is pure eye candy. If you don't fancy paying quite this much and you prefer your books to be written in English, Kerry and Lynne's new book 500 Quilt Blocks: The Only Quilt Block Compendium You'll Ever Need feels like the anglicised version of '163' and offers even more blocks (and when I say it feels like an anglicised version, I don't mean a copy - more that the kinds of beautiful fabrics used give a comparable flavour to the books). 500 Quilt Blocks shows a block, gives you brief instructions on assembling it and then gives you several other variants on the same block on subsequent pages. Above is the Mill Wheel block and below left are variants on the Mill Wheel. 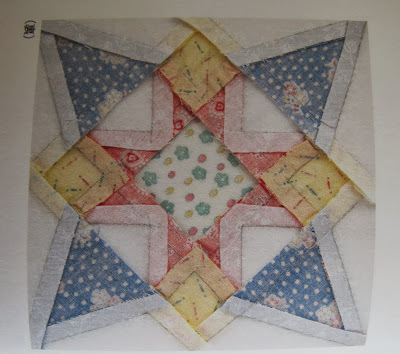 Not only does this give you an idea of how to tweak a block, so that a homogenous feel can be maintained if you wanted to make a whole quilt based around one block but would like to give it a bit more interest, but it also gives a fantastic sense of how a block can be changed by colour, tone, pattern and placement of these elements. There's a close-up of one of the variation pages below. It may be apparent from the hand to book ratio in the photo above that this book is tiny, measuring 6"x6, however, it's one inch thick and jam-packed, so not short on content. Personally, I wish the publisher would offer a larger size of this book when it goes into a second print run, as these variations deserve to be seen at a larger scale...and because my eyes are not the best for differentiating between colours in low light and so it prohibits proper bedside viewing for me (there's daily ribbing about this from my husband as I insist on having the main light on until the moment I get into bed as I don't even like doing something as basic as folding my clothes away with just the bedside lights on). I am aware that at 36 years old I have made myself sound like I'm 100 by requesting that a book be made larger. My next post will feature thoughts about denture fixatives and rumination over why my letter from the Queen didn't arrive on the actual day of my centenary birthday. 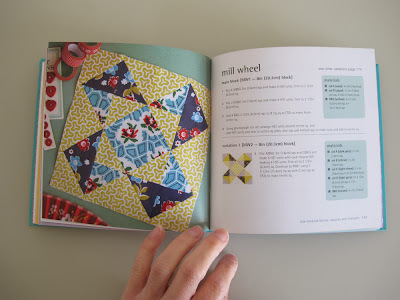 The quilt blocks in this book are beautiful - the fabric choices are just so lovely and remove all the usual stuffiness out of a quilt block book. And their work. It is so perfect. Creating 500 blocks that are so perfectly, perfectly square and that will sit so perfectly, perfectly true for photographing is what tells you that you are in safe hands following Kerry and Lynne's guidance (all of these blocks, including the tiny variants, look as though they've actually been made by hand, rather than created in quilting software and then pattern-filled). My favourite block is this Electric Fan below - the colours and crisp curves (can you have a crisp curve? This feels like an example of one) make me think of Orla Kiely's designs. The book has a comprehensive introduction covering all the basic techniques you'll need to complete the blocks. Again, it's tiny, but there's so much information packed in there. Did you know that it's better to use a dry iron when pressing a quilt block, as steam can distort it? I love it when I discover a glaring gap in my knowledge. 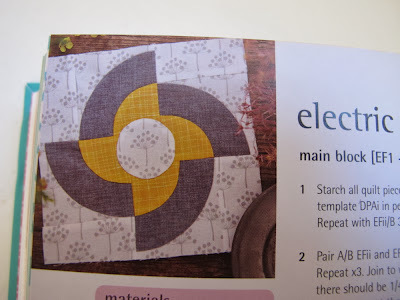 This method also has the potential benefit of meaning you don't have to run the will-my-iron-suddenly-splatter-limescaley-water-all-over-my-just-finished-quilt-block gauntlet. Or is that just my iron? It looks clean, it's descaled regularly and yet it delights in squirrelling away grubby water in crevices my descaling apparently can't reach, to throw out suddenly at inopportune times. You can find this book here . If you're familiar with Kerry and Lynne's blogs it's a game in itself to go through the book guessing which one of them made each block by looking at the fabric choices. Finally, I wanted to tell you about Jinny Beyer's book, The Quilter's Album of Patchwork Patterns: More Than 4, 050 Pieced Designs for Quilters . I bought this book a few years ago and again, it's one that I've looked through often enough to justify its high price. It's a great tomb of a book, bound in hardback that would flatten small elephants if it landed on them. 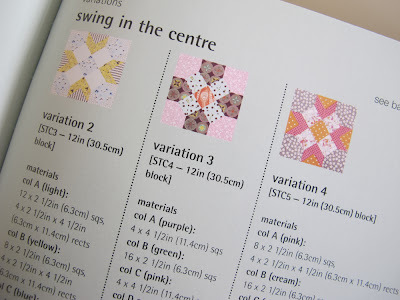 Out of the three books I've featured here it's by far the most exhaustive, however, if you favour more modern fabrics it does take a substantial amount of imagination to transpose in your mind the myriad of quilt blocks onto more up-to-date fabrics. 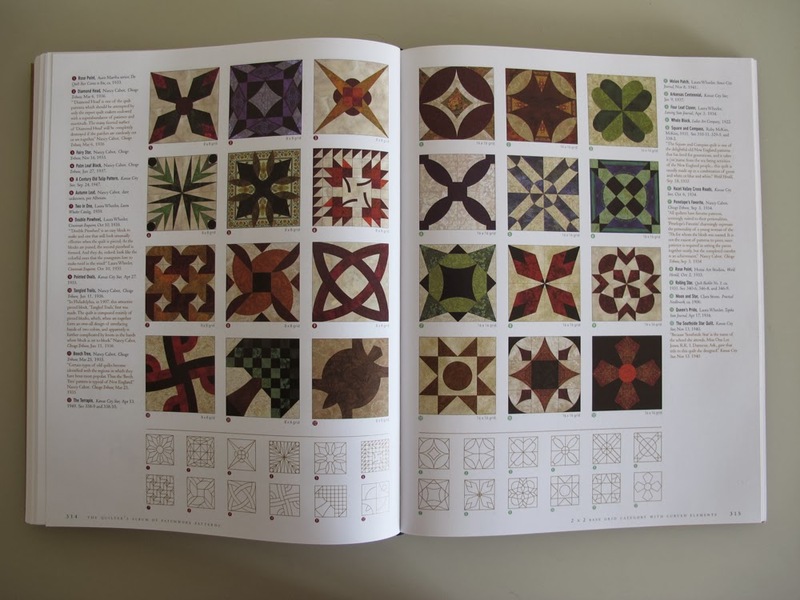 Additionally, most of the quilt blocks in the book are computer generated, which I'm not a fan of. However, despite my perceived drawbacks, it's an amazing book. The book comes with a transparency grid sheet, so that it can be placed over any block and studied to help you in determining whether it's been drawn on a 2x2 base grid or an 26 x 26 base grid or anything in between (although it's always mystified me as to why they couldn't just tell me that bit next to each block). Once you've ascertained that though, in theory, following the instructions at the beginning of the book, you should have all the information you need to redraw absolutely any block by referring to the block's line drawing, which is shown at the bottom of each page. 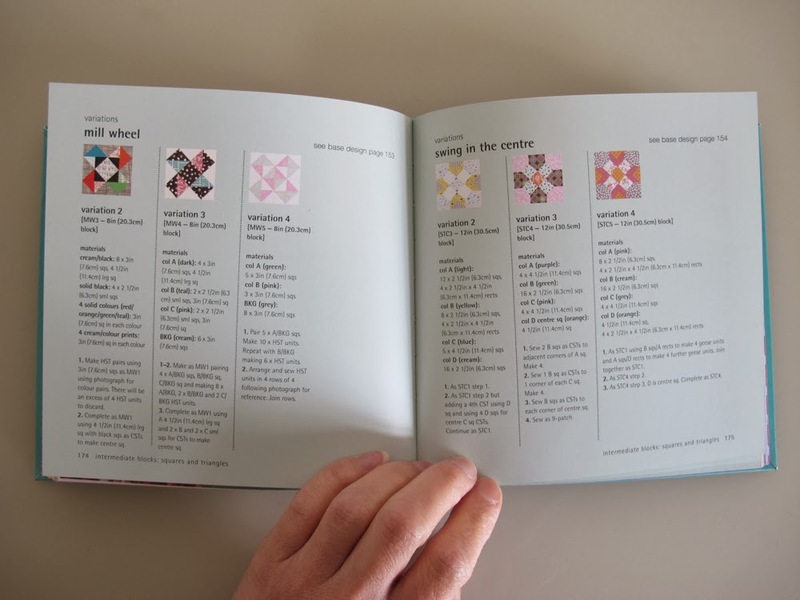 This is basically the book you'd want if you're interested in designing your own variations of traditional or modern quilt blocks or if you prefer to draft quilt blocks on paper, although you can obviously redraw any of these blocks using computer software too. The links in this post are amazon affiliate links - it means that if you buy the book after clicking on my link they give me a tiny cut of the profits. It doesn't increase the price for the buyer, nor does it mean any of your details are passed on to me...it just means Amazon share their profits with me). If you'd rather this didn't happen but would like to buy the book, simply open Amazon in a new tab and type the book title in independently. Do share any books you love in the comments - it's always lovely to find new sources of inspiration. This is just a very quick post to firstly thank those of you who rushed to my aid and helped to clear out my drawers of fabric so incredibly quickly after my last post - I am truly grateful! 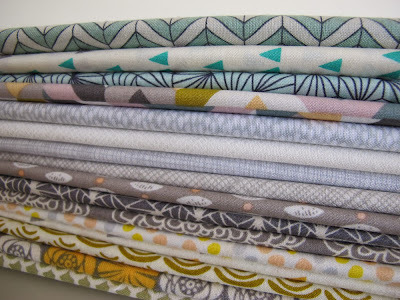 There are still a few bundles left and if you'd like 20% off the price of any of those, just type in the discount code '20PERCENT' at the checkout and your fabric will soon be on its way to you. You can find my shop here. I've also realised that many of my postage estimates were wrong, so I've now refunded anyone who paid excess postage above the actual cost of posting. I'll continue to do this for any future orders from my Etsy shop. Posting so far has taken several trips, but all the fabrics are now on their way to their future homes. One of those trips was slightly traumatic, as when I came in from the pouring rain, I saw that what I'd thought was a biro, turned out not to be and the lovely lady at the post office very sweetly put Sellotape over all my address labels for me to stop the addresses from smudging! If you're the recipient of one of those highly Sellotaped parcels then I'm really sorry that the outer packaging looked less than pretty, but I hope you liked what you found on the inside. 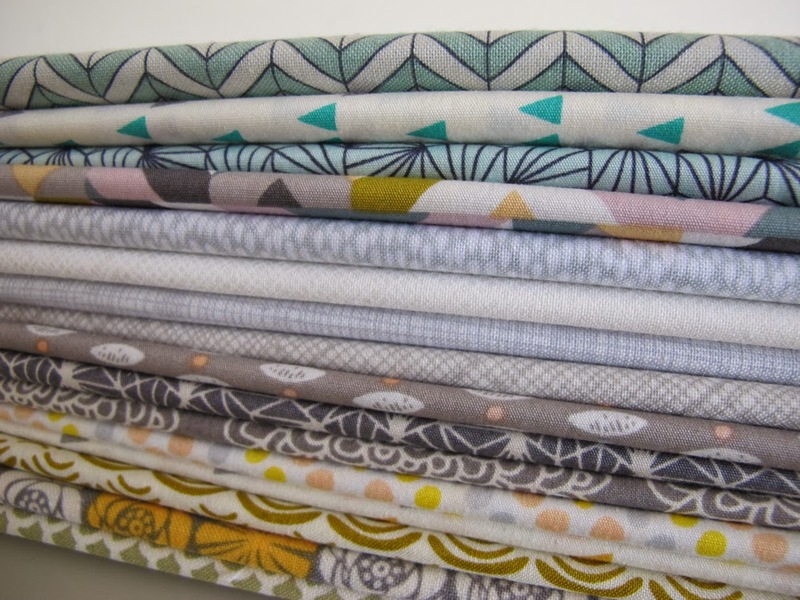 Anyway, again if you'd like 20% off any of the remaining fabrics, just type in the discount code (this one is clearly designed to fox people), which is...'20PERCENT' at the checkout. 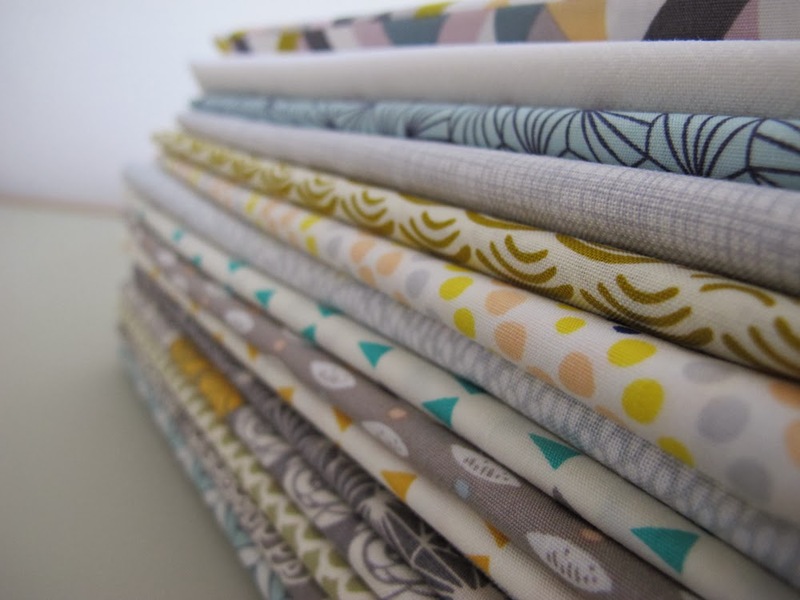 Hello lovelies, just a quick post to let you know that I'm having a huge destash of fabric over on Etsy. I'm based in the UK, but some of the pieces I've made available to overseas buyers too. Here's a little sample of what you might find there, but do go and have a look yourself, as there's a lot more than what I'm sharing here. I've tried to group things into usable colour lots, so that you can buy scrap packs to use for English paper piecing, appliqué or patchwork, or buy larger fabric bundles that will go together well when making a small throw or quilt. I hope you see something you like. That really is the tip of a very large iceberg, so do go and have a look if you're in need of some fabric. Such a very odd feeling to destash so many years of much-loved fabric in one go - I'm hoping that they will end up in lovely homes where they're no longer trapped away in a cupboard. I'm also excited to free up some cupboard space in my own house...necessitated by a chest of drawers breaking earlier this week! We're replacing them...but with something slightly smaller! Firstly, thank you so much for all your entries to the Hoop-la giveaway! Jule was the winner, as determined by my jabbing finger as I scrolled the computer screen up and down (it's a highly technical procedure). I've just visited Jule's blog, to see where the hoop will end up and was delighted to discover evidence of some insanely wonderful piglet baking (no actual pigs involved) - I think I may make my husband a birthday cake in January just like this one! Serendipitously, in a freak matching-blog-post-whirlwind, my post for today contains a fabric pig-in-mud. If ever there was a hoop winner that was meant to be, it is this one! Jule, please get in touch with your mailing address and I'll pass it on to Kirsty, so that she can send the chalkboard hoop out to you. Unfortunately, due to being out-foxed by a series of frustrating practicalities, half-term fun only really started for us when the week was nearly over, on Friday. However, luckily my son had an inset day on Monday, so we were able to make up for some of that. He initially asked to spend the day baking, but when faced with a request from his parents' already-bulging cheeks that it be savoury, not sweet, he went off the idea and refused to succumb to requests to make us stilton and broccoli cornish pasties, no matter how much we pleaded with him. 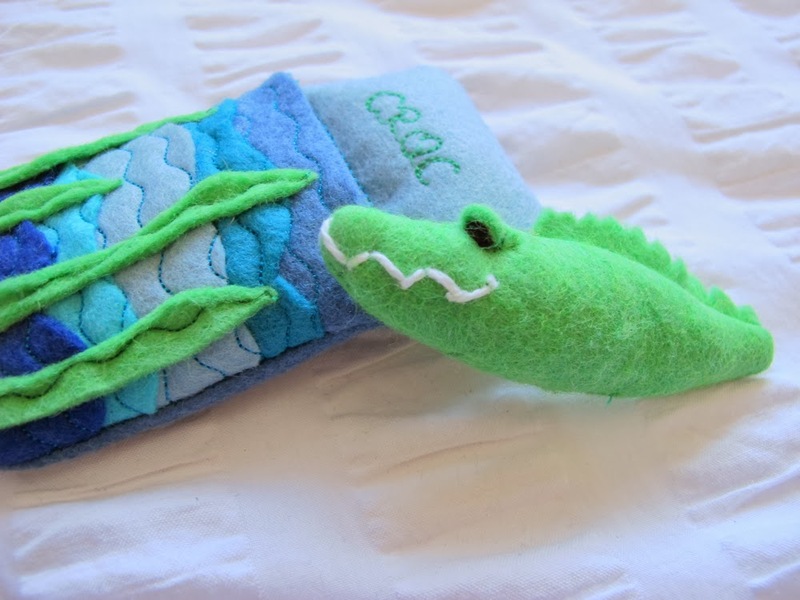 Instead, we settled upon some sewing and he came up with the idea of making a crocodile version of the mice that I'd first started making for him six years ago, around the time when he first started school. 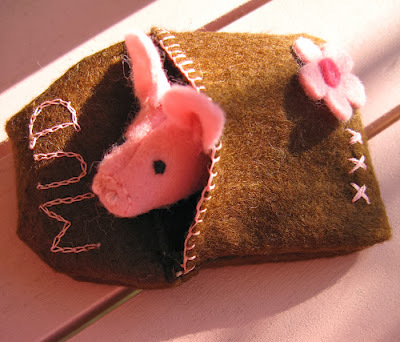 The original Mousey-in-a-bed pattern was created by the, now defunct, Molly Chicken blog and you can find it here. Molly Chicken was one of the first blogs that I read regularly and it still feels such a shame that it's no longer tended to. 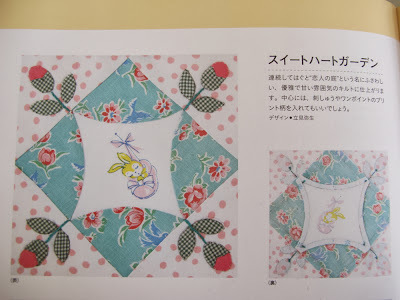 Whenever I use this pattern I always wonder what the author of Molly Chicken, Lyn, is up to now. 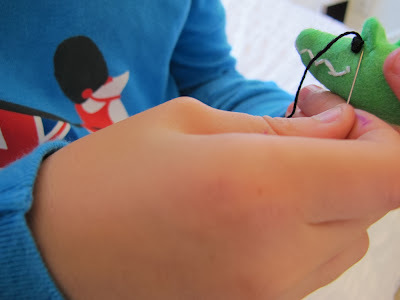 I've returned to the Molly Chicken Mousey-in-a-Bed pattern regularly over the last six years, as it's incredibly quick and easy to make (I love felt for that) and can be changed to suit a child's own tastes. 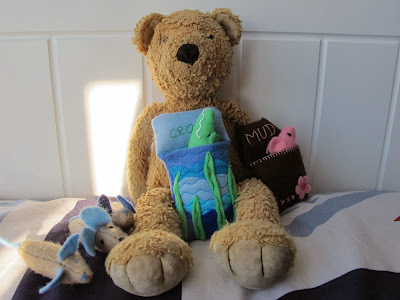 I once created a Pig-in-a-Bed-of-Mud based on it, and another time, a Ladybird-Wrapped-in-a-Leaf, so I was more than happy to have a go at making a Crocodile-in-a-Swamp-Bed with my son. He was so pleased with how this turned out. 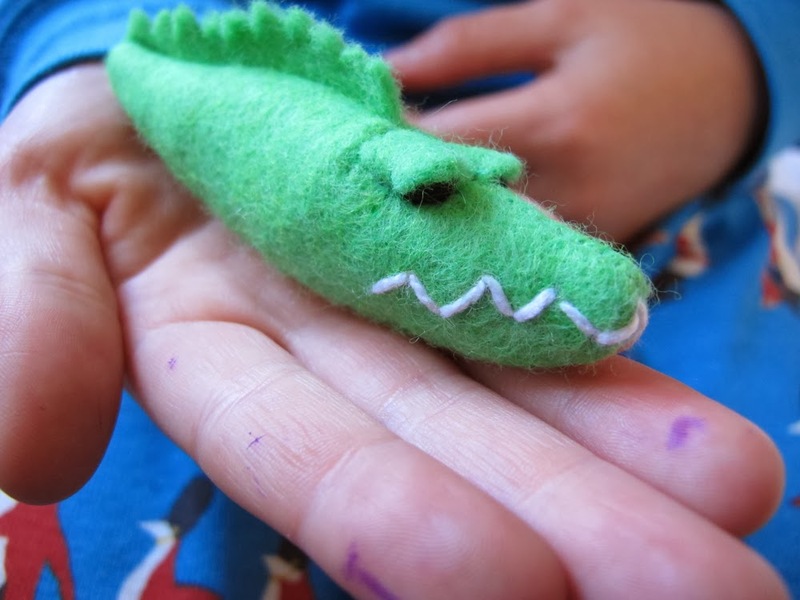 We spent a long time referring to books to try and get his shape right and my son eventually suggested sewing down the ears to make them into eye-covers instead, which worked brilliantly and makes it look much more crocodiley. He used a mixture of machine and hand-sewing. And I was excited to see that the alphabet on my machine, which I've always shunned, actually turned out beautifully when used on felt. 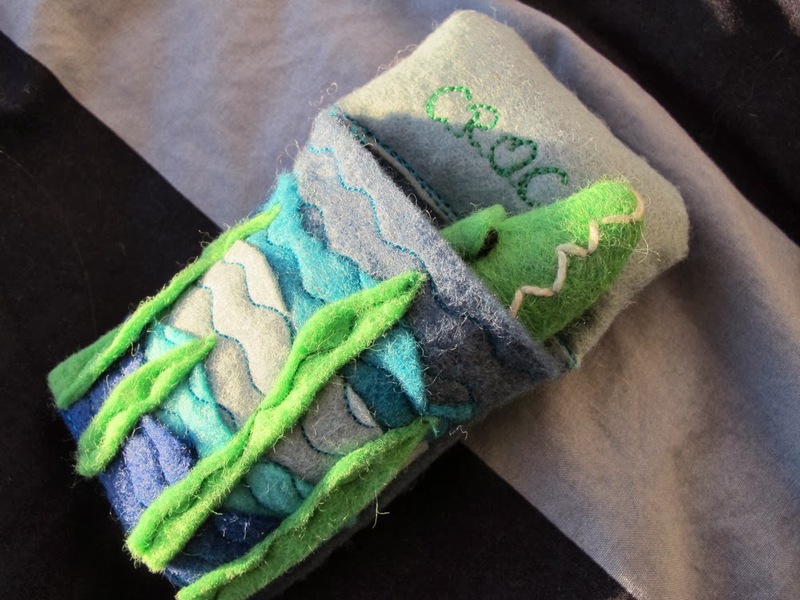 My son is slightly bored by the prospect of a straight stitch (and a mother insisting that it's really all that's needed) when faced with a chart of over 100 more interesting potential stitches, so he came up with the idea of sewing down the layers of wavy felt he'd cut using a similarly wavy stitch. My son's room is invariably an absolute mess, but he does often create 'displays' of things within the chaos. This is what greeted me when I went into his room later in the day. The mice have mostly lost their beds down the back of the radiator, but it's nice that he still has so many of them. If you have a spare half-hour and know a child (any child! ), I'd implore you to have a go at making one of these mousey-in-a-bed creations - they seem to stand the test of time, appeal to all ages of children and are easy and satisfying to make (and if you don't like working with felt and have bigger bears to accommodate, you could always try my Three Bears' Sleeping Bag Pattern - it takes a little longer as it's constructed in a different way, due to using fabric, rather than felt, but it's still a relatively quick make).